Police are warning residents of Chicago's West Lawn neighborhood of a man who tried to lure a 15-year-old girl into his car and followed her into a store after she refused. 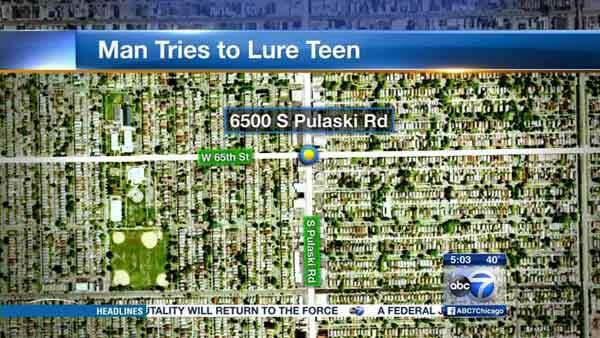 CHICAGO (WLS) -- Police are warning residents of Chicago's West Lawn neighborhood of a man who tried to lure a 15-year-old girl into his car and followed her into a store after she refused. A community alert from police said a man walked up to the girl in the 6500-block of South Pulaski Road around 12:15 p.m. Sunday and asked, in Spanish, if she needed a ride. She walked into a nearby store to call police. He followed her inside and continued to try talking to her, police said. He left a short time later. Police said he drove away in a royal blue pick-up truck. The suspect is described as a Hispanic man in his late 20s or early 30s. He has short black hair, thick eyebrows and was clean shaven at the time of the incident. He was wearing black leather jacket, black jeans, tan work boots and a maroon baseball cap with a white eagle on it. Anyone with information regarding this incident should call Area Central detectives at (312) 747-8380.